New Winter 2018: These cute dudes are the best of friends! The frogs are fun! brothers personalized Christmas ornament features a pair of green guys arm in arm ready to exchange holiday gifts. The frogs are wearing Santa caps, and their legs dangle delightfully beneath, creating wiggly fun for all. These are boys ornaments personalized for the pair, so we'll hand paint the information you provide to create an instant favorite and one that will grow in sentimental value in the years ahead. 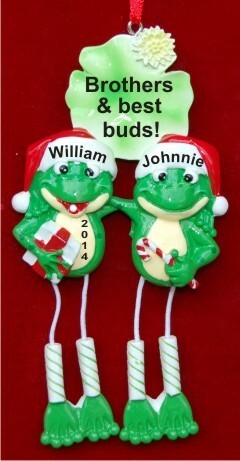 Capture the fun of these special years with the frog brothers Christmas ornament personalized to be one of a kind.